The serve in tennis can have the biggest impact on a point, but can also be the most challenging shot to execute. Through the guidance of our coaches, we take students through multiple stages of learning how to serve and provide modifications based on physical abilities of younger students to better help them grow as tennis players. A serve is always used to start a point and get the ball into play, but the ball must first land in the deuce court — which is the box on your opponent’s side that is opposite to the one you are serving behind. Each serve must be executed from behind the baseline and you can only step on or cross the baseline once you have made contact with the ball or it is considered a foot fault. If the first serve goes into the net or doesn’t land inside the opponent’s deuce court, that is called a fault and a second serve is attempted. Like with any shot in tennis, the line is considered inbounds. The more advanced players generate speed and create movement on a ball by using an overhead serve. 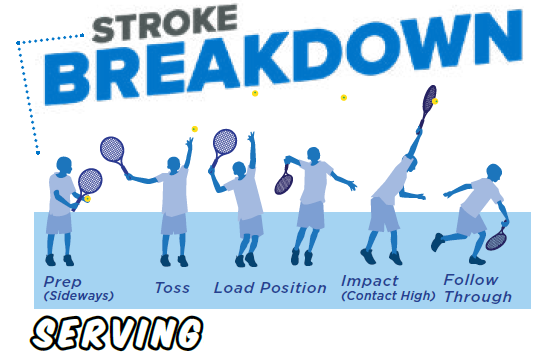 However, this can be challenging for most beginners, which is why we teach students to start with an underhand serve using a motion similar to a forehand stroke. To help students transition from an underhand to overhead serve, our coaches focus on three key parts of a successful serve: the toss, point of contact, and follow through. Students work on each of these one step at a time with a partner to ease the transition. A game the students have fun with is called Target Practice. The coach will set up targets using cones or colorful dots on one side of the net and have students rotate through trying to hit the target with a serve. An additional student can also be placed behind the targets to return shots and start a rally point. Underhand and overhead serves can also be practiced at home with a racquet, tennis ball, and hard-surfaced wall (we don’t recommend using a garage door). Use tape or chalk to measure up from the ground roughly 3 feet to imitate a net and aim for a spot over that line. Learn more about other tennis skills at a TGA program near you.